Lexus has launched its all-new CT 200h luxury hybrid. The CT 200h debuts a host of world, industry and Lexus firsts. It is the world's first compact luxury hybrid. Other automotive world-firsts include: a selectable instrument display with a hybrid ECO meter or tachometer (available on selected models); the use of eco-plastics featuring bio-PET; and the introduction of a Pre-Collision safety System (PCS) (available on selected models) to the compact luxury segment. The CT 200h's roll call of industry-firsts delivers audio system speakers made from bamboo-charcoal resin, an integrated front stabiliser bar design, an aerodynamic muffler design and an engine vibration-dampening engine mount. In a first for Lexus, the CT 200h features a "two mood, two mode" drive functionality that lets the driver choose the level of driver-vehicle interaction, and offers the longest driving range of any Lexus. Other Lexus firsts include the rear seat sensors that detect passengers and adjust climate control performance (available on selected models), an electric water pump, a digital (Class-D) audio amplifier and electro-shiftmatic transmission selector. Lexus Australia chief executive Tony Cramb said the CT 200h would boost Lexus' appeal and make hybrids accessible to more Australian motorists. "The CT 200h is truly a breakthrough vehicle," he said. "It doesn't just look good - it brings with it a level of innovation and range of features unheard of in the compact luxury segment," Mr Cramb said. "CT 200h will give Australians greater choice when it comes to entering the luxury vehicle market - at an attractive price point." The Lexus CT 200h will consume as little as 4.1 litres of fuel for every 100 km (depending on driving conditions/style, vehicle conditions and options/accessories) and emit 95 grammes of CO2 per kilometre. The new CT 200h has the widest choice of equipment grades, options, exterior colours and trim ever offered in a Lexus model. Lexus provides four equipment grades and a total of 80 combinations of colours and trim, including 10 exterior colours and either fabric or genuine leather seat facings. The model grades - Prestige, Luxury, F Sport and Sports Luxury - form what Lexus calls a "Y" strategy. In addition, CT 200h customers can access luxury features available in higher-grade models via the Prestige Enhancement Packs or the Luxury model. Sports Luxury customers can tailor the exterior appearance of their vehicle to personal taste, selecting the discreet standard look or the more aggressive sports look (bumpers, side skirts and larger rear spoiler) available in the F Sport model grade. 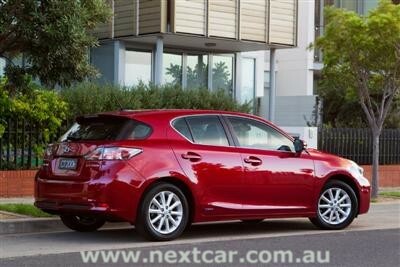 Lexus CT 200h is well specified throughout. All four CT 200h equipment grades have: 100 kW hybrid powerplant; Electronically-controlled Continuously Variable Transmission (E-CVT); Drive Mode Select (EV, ECO, NORMAL and SPORT); eight SRS airbags; full active safety package of ABS, Electronic Brake-force Distribution (EBD), Brake Assist (BA), Vehicle Stability Control and Traction Control; emergency flashing brake lights; Daytime Running Lamps (DRL); mood lighting around the Drive Mode Select dial and overhead illumination; dual-zone climate control air conditioning; Hill-start Assist Control (HAC); Smart Start; Multi-Information Display (MID); four alloy wheels with Yokohama 'dB decibel E70' tyres; 60/40-split fold rear seat with flat floor; genuine leather steering wheel; hydrophilic and heated exterior mirrors; cruise control; rear spoiler; and engine immobiliser. Two Enhancement Packs are offered for Prestige grade. The Leather Enhancement Pack adds leather-accented trim (in lieu of fabric trim) in three colours: Black, Water White, and Ivory. It also provides 17-inch alloy wheels in lieu of 16-inch, front-seat heaters, reversing camera and self-dimming interior mirror with the reversing camera image shown in the mirror. The Leather and Moonroof Enhancement Pack adds all the features of the Leather Enhancement Pack and an outer-slide moonroof. 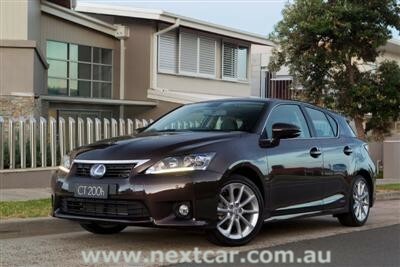 Lexus CT 200h Luxury has a range of features over and above Prestige grade, including all five features from the Leather and Moonroof Enhancement Pack. Its additional features over Prestige grade include: satellite navigation; reversing camera with image shown on the navigation screen; Lexus Remote Touch; Smart Entry; 10-speaker audio with 6-CD changer, sub-woofer and separate amplifier in lieu of six-speaker audio and single CD; Bluetooth* mobile telephone connectivity; rain-sensing wipers; leather-accented trim; front-seat heaters; 17-inch alloy wheels; self-dimming interior mirror and moonroof. CT 200h F Sport has a wide range of specification above Luxury grade, beginning with a unique package of F Sport-developed features: suspension tuning; black leather-accented seats with white-grey perforation; scuff plates; upper grille and badging, as well as sports pedals; smoke-finish 17-inch alloy wheels; and rear and rear-side privacy glass. The F Sport model also has sports bumpers, sports side skirts and a large rear spoiler in lieu of small rear spoiler. In addition, F Sport has special features that are also offered in top-of-the-range Sports Luxury grade: performance dampers front and rear; driver's power-operated 10-way adjustable seat with memory; electric lumbar support adjustment; anti-theft siren, intrusion sensor and bonnet switch; tachometer when in SPORT mode; mood lighting in the instrumentation; front fog lamps; and exterior mirrors with memory, self-dimming function and auto-retract. CT 200h F Sport offers moonroof as optional equipment. CT 200h Sports Luxury has the unique features of a segment-first Pre-Collision safety System (PCS) including Pre-Collision Brake; Active (radar) Cruiser Control (ACC), which is joined by LED low-beam headlamps with auto level and headlamp cleaners; clearance and reversing sonar; Smart key card and dark brown woodgrain panel. It also offers a Sports Enhancement Pack, consisting of sports bumper (with standard grille), sports side skirts and a larger rear spoiler. Ten exterior colours are offered across the range, including newly released Solar Flare (Metallic Yellow) and Volcanic Bronze. Lexus also provides CT 200h in White Pearl, Silver Metallic, Graphite, Onyx, Elysium Blue, Vermillion, Flame Blue and Blue Pearl. The fabric seat and door trim in CT 200h Prestige comes in a choice of three colours - Black, Ivory Splash and Redback (a combination of red and black). The leather-accented trim in Prestige Enhancement Pack models, Luxury, F Sport and Sports Luxury is available in Black, Ivory and Water White (Bluish Grey). Lexus has priced each of the four CT 200h model variants to be competitive in the compact luxury segment, while enticing customers from mainstream compact vehicles - many of which are priced close to $40,000*. The Prestige model is priced from $39,990* (MLP*). "At Lexus, we believe in treating customers as though they were guests in our own home, and with CT 200h it will be no different." "The Lexus covenant of delivering world-class service and support comes standard." "CT 200h also brings greater choice and equipment to the compact luxury segment, with its unique hybrid drive train and onboard technology - some of which is normally out of reach of compact luxury vehicle buyers," said Mr Cramb. Customers will also enjoy the peace of mind of a segment-leading four-year, 100,000-kilometre warranty and an eight-year warranty on the hybrid battery. • Leather option includes 17-inch wheels, front seat heaters, reverse camera and an auto dimming interior mirror. • Leather and moonroof is as above, plus moonroof. • Moonroof option pack is moonroof only. NOTE: * All prices are manufacturer's list prices and do not include dealer delivery fees and the state/territory statutory charges. 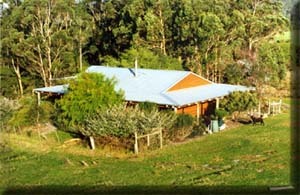 Additionally, all prices, fees and charges are subject to change without notice. Lexus' all-new CT 200h is big on little details that save energy. Advanced features include proactive seat heaters, intelligent climate control, LED lighting, smart audio systems and bio-sourced materials. Headlining these new features is Lexus' unique proactive front seat heater functionality, which is available wherever leather-accented seat trim is selected. CT 200h's front-seat heaters have been designed to operate in concert with the air-conditioning system, reducing the workload of the air-conditioning heater to aid fuel economy. To increase efficiency, the air conditioning reduces heater operation when front seat heaters are in use. This has the added benefit of reducing loading on the engine, allowing it to reach optimum operating temperature quicker. This feature is automatically overridden when a passenger is detected in the rear seats - switching back to use of the climate control system to warm all passengers. Energy economy is also boosted by an intelligent climate control system which draws power from the CT 200h's hybrid battery - reducing parasitic power losses and engine loading. Engineers have also used a larger air-conditioning compressor, allowing the unit to run at below capacity for the majority of the time - promoting energy efficiency and noise minimisation. The integrated inverter contains a centrifugal oil separator that removes oil from the refrigerant, reducing the amount of oil escaping from the compressor - allowing for a more effective refrigerant cycle and overall cooling performance. The extensive use of LED lighting both inside and outside the CT 200h further reduces parasitic power losses. Notably, CT 200h's LED low beam headlights on Sports Luxury models use up to 45 per cent less power than conventional headlamps. LED headlamps, combined with the 89 LED bulbs throughout the CT 200h, significantly reduce power consumption and engine loadings. An all-new D Class amplifier makes its debut in CT models equipped with navigation and complements the CT 200h's overall power-saving strategy. The new digital amplifier uses 50 per cent less power and is 26 per cent lighter than a traditional analogue amplifier. Bio-sourced materials also help lower CT 200h's overall CO2 footprint. Lexus Hybrid Drive allows CT 200h to mix and match the power from its petrol engine and electric drive motor - for better performance and efficiency. Power from the two sources is finely controlled to maximise power delivery, efficiency and comfort - and delivered seamlessly through an Electronically-controlled Continuously Variable Transmission (E-CVT). In CT 200h, the electric drive motor alone is used for gentle take-off and reversing, and for assisting the petrol engine when accelerating and hill-climbing. In normal cruising, the petrol engine drives the wheels, with surplus petrol engine power routed to the generator (MG1) to recharge the battery. Under normal and hard acceleration, the battery supplies additional energy to the electric motor while the engine and motor provide smooth acceleration response. When decelerating and under brakes, the electric motor recovers the kinetic energy and converts it into electricity, which is stored in the HV battery for future use. The petrol engine typically switches off when the car is stationary, braking or coasting, to save fuel and reduce exhaust emissions. Lexus CT 200h's electronic computer-controlled Continuously Variable Transmission means the car operates in a similar way to an automatic - but with no perceptible gear-ratio changes. The only difference is that CT 200h has a "B" position on the Electro-Shiftmatic gear-lever. Selecting B provides an engine-braking effect - even when the petrol engine is stopped. The new CT 200h's Lexus Hybrid Drive (LHD) system combines leading-edge innovation, design and packaging. Except for the HV battery, all the key components of the LHD system are housed in the engine bay. The transaxle, for example, which contains two electric motor/generators and a compound set of planetary gears, occupies the same space as a conventional automatic transmission. Petrol engine: A 1.8-litre VVT-i equipped four-cylinder in-line petrol engine, the 2ZR-FXE. It uses the high-efficiency Atkinson Cycle process. Transaxle: The mechanical heart of the Lexus Hybrid Drive system, designed to deliver top-level driving performance and fuel economy. It incorporates a torque damper, a power-split device, two high-output electric motor/generators, a motor-speed reduction device, an Electronically-controlled Continually Variable Transmission (E-CVT) and a counter gear to the differential in a casing the same size as a conventional automatic transmission. One of the secrets is that LHD uses two (linked) sets of planetary gears to perform three roles - power-split device, motor speed reduction and the E-CVT. First motor/generator (MG1): Acts primarily as a generator, to convert excess petrol engine power into electricity - so it can be stored in the HV battery. It also acts as the starter motor for the petrol engine. Second motor/generator (MG2): Acts primarily as the electric drive motor, but also as a generator when the vehicle is in regenerative braking mode. Inverter: Converts alternating current from motor/generators to direct current for storage in the battery, and direct current from the battery back to AC for the electric drive motor. The inverter is water-cooled and has an exclusive electric water pump. Boost or step-up converter: Boosts DC 201.6V from the HV battery to a maximum 650V for the high-voltage electric drive motor - for high power with low resistive losses. It also converts electricity from the generator to DC 201.6V for storage in the battery. DC-DC converter: Converts DC 201.6V power from the HV battery and/or the generator to DC 14V, to power ancillary devices (such as the power steering, electric water pump, electric air conditioning compressor pump and headlamps) and to charge the auxiliary battery. CT 200h therefore uses a DC/DC converter to deliver 14V power in lieu of having a conventional 12V alternator driven by belt from the petrol engine. Hybrid battery: The HV battery is a DC 201.6V battery that stores the energy until it is required to propel the vehicle. It is charged and discharged during the driving cycle, according to driving conditions - for example, gaining charge during regenerative braking and when the vehicle is coasting; and discharging when the vehicle is accelerating hard or hill-climbing or operating on the electric motor only. Lexus Hybrid Drive control computer: A dedicated computer with special software to coordinate and control the petrol engine, electric motor/generators and E-CVT - for seamless performance. It continually adjusts the rotation speeds of the petrol engine, generator and drive motor when the vehicle is accelerating or decelerating. The computer control system also interacts with CT 200h's electronically controlled braking system. Lexus CT 200h's highly efficient 1.8-litre petrol engine uses a range of industry and Lexus-first technology. It was designed to combine driveability and Lexus NVH standards with optimum fuel efficiency, low emissions and the ability to seamlessly start and stop. Special features include the industry-first use of vibration-damping engine mounts, a flat muffler, and the Lexus-first of an electric water pump. The four vibration-damping engine mounts incorporate a specially tuned rubber spring rate and clearance, to suppress vibration and thereby enhance handling performance. The flat muffler reduces intrusion into the cabin to achieve increased interior space, and allows for an inclined underfloor angle and improved aerodynamics as a consequence. The muffler has a variable valve, to optimise engine output and noise control, and allow CT 200h's designers to make the muffler more compact. The electric water pump reduces power losses from the petrol engine and improves engine warm-up. It circulates engine coolant - even when the petrol engine is stopped as part of normal Lexus Hybrid Drive operating conditions. Lexus CT 200h also has an electric air-conditioner compressor, to reduce power drain on the petrol engine and increase flexibility for hybrid operations. The petrol engine switches off when the vehicle is stationary or coasting - thereby saving fuel - but air conditioner performance is maintained. CT 200h's Lexus 2ZR-FXE engine adopts the Atkinson Cycle - also known as "high expansion cycle" - to maximise engine efficiency. It therefore harnesses more of the energy into torque on the crankshaft, which would otherwise be lost in an Otto Cycle engine. Lexus has combined the Atkinson Cycle with an electronic throttle, direct ignition, twin-camshafts, a multi-valve cylinder head and Variable Valve Timing with intelligence (VVT-i) on the inlet camshaft, all of which improve efficiency. The 2ZR-FXE engine also has cooled Exhaust Gas Recirculation and a bespoke engine heat-management system. In a conventional (Otto) cycle engine, the compression stroke volume and expansion stroke volume are practically identical, and the compression ratio and expansion ratio are identical. Any attempt to increase the expansion ratio results in an increase in compression ratio and greater likelihood of engine-damaging knock, also known as "pre-ignition" or "detonation". The Atkinson Cycle process in the Lexus CT 200h petrol engine solves this dilemma by delaying the closing of the intake valves. The intake valves remain open for the initial stage of the compression stroke (when the piston is ascending), delaying the start of compression and reducing the effective compression ratio. However, the 2ZR-FXE still has a relatively high compression ratio of 13.0:1. This slight amount of back-flow into the intake manifold produces a benefit in partial load conditions: it allows for an increase in throttle-valve opening, reducing intake manifold vacuum and reducing intake pumping losses. The new CT 200h's Lexus Hybrid Drive electric motor can operate on up to 650 Volts AC in SPORT driving mode, to optimise performance. Operating voltage is 500V in EV, ECO and NORMAL modes. Electric-motor performance has been further boosted by employing a reduction planetary gear. CT 200h's electrical system components were designed to optimise performance, fuel economy and package efficiency. The system includes an advanced Power Control Unit (PCU) and a compact sealed nickel metal hydride battery. The generator has concentrated coil winding to minimise weight. The air-cooled permanent-magnet synchronous 3JM electric drive motor delivers 60 kW of power and 207 Nm of torque. CT 200h has a second planetary gear set in its Lexus Hybrid Drive system, to act as a reduction gear for the electric drive motor. Adding the reduction gear - a feature used in all Lexus hybrid models - allowed CT 200h designers to use the more compact and efficient electric drive motor while improving performance. During deceleration the electric drive motor acts as a high-output generator for regenerative braking. Kinetic energy, which would otherwise be wasted as heat through the brakes, is converted to electrical energy and stored in the HV battery for future use. The CT 200h Power Control Unit (PCU) is the centrepiece of the new system. The new integrated PCU incorporates the main voltage boost converter that pushes hybrid battery voltage from 201.6 Volts DC to 500 or 650 Volts, depending on drive mode. It also contains an inverter to convert the direct current to alternating current for the electric drive motor, and vice-versa. In addition, the PCU has a DC/DC converter to convert 201.6-volt DC power from the battery and/or the generator to 14 volts DC, to power ancillary devices (such as the power steering, electric water pump and headlamps) and charge the auxiliary battery. Lexus CT 200h uses a DC/DC converter to deliver 14-volt power in lieu of having a conventional 12V alternator driven by belt from the petrol engine. The new CT 200h has the Lexus-first feature of Drive Mode Select, as part of the compact hybrid's two-moods/two modes personality. CT 200h has four drive modes in total, each with its own unique set of characteristics. It therefore offers either a dynamic or relaxing driving mood, depending on driver preference, while further improving either performance and dynamic ability, or driving efficiency, fuel economy and emissions. The modes are matched to two moods of ambient lighting - hybrid-blue signifying serenity and red signifying excitement. There is a button on the centre console to select EV Mode, and a three-position dial adjacent to that button to select ECO, NORMAL or SPORT. The ambient lighting is hybrid blue in ECO or NORMAL mode, and red in SPORT mode. Uniquely, on F Sport and Sports Luxury models, selecting SPORT mode also changes the hybrid system indicator dial to become a tachometer for the petrol engine. attention paid to ride comfort and smooth acceleration. From start-up and at speeds of less than 45 km/h, the CT 200h can automatically operate in EV mode, driving under electric motor power alone. The driver may also select EV mode manually. Vehicle range in EV mode is subject to the level of charge in the HV battery. EV is a unique driving mode, not available to drivers of mild hybrid vehicles; it requires the full hybrid technology of Lexus Hybrid Drive. The EV drive mode allows for relaxing urban driving with minimal noise, and zero CO2, NOx and particulate emissions, for up to two kilometres. The petrol engine is switched off throughout its operation, thereby significantly reducing this new Lexus' overall fuel consumption. EV can be selected while in any other drive mode and adds its unique characteristics to that of the current drive mode. In ECO mode, throttle response to aggressive accelerator pedal inputs is reduced and air-conditioning control optimised for improved fuel economy. Depending on driving conditions, the ECO mode can help drivers adopt a relaxed driving style, and can achieve a perceptible reduction in fuel consumption. The vehicle will remain in ECO mode even when the ignition is switched on and off. The vehicle's supply voltage is limited to 500 Volts in ECO mode. However, as a safety feature for overtaking and emergency acceleration, the system will deliver 650 Volts if the throttle pedal is pressed hard. Specifically tuned to deliver greater electric motor power, SPORT mode focuses on a dynamic driving mood, maximising the new CT 200h's performance and agility. The hybrid-system PCU (power control unit) boosts supply voltage by 150 Volts to a maximum 650 Volts, increasing overall powertrain output. Petrol engine revs are held higher, and electronic throttle and Electric Power Steering (EPS) settings are modified to give a faster response to driver inputs. In addition, SPORT mode provides less intrusive operation of the Vehicle Stability Control (VSC) and Traction Control (TRC) systems, allowing drivers to fully exploit the vehicle's extended dynamic abilities. The SPORT driving mode will reset to NORMAL when the ignition is switched off. Lexus CT 200h's new SPORT driving mode transforms the vehicle's character - changing throttle response, electric-drive voltage and steering feedback, as well as the Vehicle Stability Control (VSC) and Traction Control parameters. The SPORT drive mode also alters CT 200h's engine-stop function, to ensure that at speeds above 35 km/h the petrol engine is available more readily, thereby increasing throttle responsiveness. CT 200h's ambient lighting changes from hybrid-blue to red when the driver selects SPORT mode via the drive mode select dial. - Less-intrusive calibration of the Traction Control. In SPORT mode, the VSC controls the braking and driving force to reduce understeer, increasing safety and providing sporty handling to match the driver's intent. On corner entry, the VSC maintains high petrol engine revolutions after the driver releases the accelerator pedal, to enhance engine-braking effectiveness and help balance the vehicle. This calibration also ensures the vehicle has crisp acceleration when the driver applies throttle through and out of the corner. The SPORT mode Traction Control calibration brakes the inside front wheel during corners, to suppress understeer and help the driver maintain the desired line while accelerating. Lexus CT 200h has an Electronically-controlled Continuously Variable Transmission (E-CVT) for seamless acceleration and maximum efficiency. It ensures that CT 200h always has the ideal gear ratio. The transmission shift lever has an Electro Shiftmatic gear lever - a Lexus Australia-first - which returns to its home position after each selection. The selection options are: Drive, Neutral, Reverse and Brake (which provides an engine-braking effect). The E-CVT is based on two linked sets of planetary gears. It therefore has no energy loss through slippage, as would be the case with a torque converter. The Lexus Hybrid Drive control computer ensures that CT 200h is ideally geared at all times, by controlling the rotational speeds of the three key components in the LHD system - the petrol engine and the two electric motor/generators. It does this by using the petrol engine's electronic throttle and controlling the rotational speed of the MG1. Lexus designed CT 200h to achieve segment-leading NVH (noise, vibration and harshness) performance. Lexus engineers paid careful attention to NVH levels during final development, cycling through various engine mounts, body dampers and suspension mounting materials to ensure that CT 200h performed at the top of its segment. Industry-first use of vibration-dampening engine mounts incorporates a specially tuned rubber spring rate and clearance to suppress vibration while ensuring engine movement is controlled during spirited driving. Internal testing showed that the CT 200h excelled in the areas of AI (Articulation Index), which measures the level at which conversations can be carried out. It achieved rankings well ahead of the two segment leaders. A completely new flat muffler keeps the noise down, which decreases intrusion of the exhaust into the cabin. This has allowed engineers to design a floorpan that has optimal aerodynamic efficiency. Around town, the CT 200h excels in preventing road noise intrusion and engine noise, aided by specially developed Yokohama dB tyres. The Lexus-quiet cabin comes after careful consideration of insulation materials, and more importantly rear-door structures - which in hatches have a tendency to transmit road noise. The adoption of a small dynamic damper in the rear tailgate manages and reduces the noise intrusion and the booming present in some hatchbacks. Lexus used further sound-absorbing material in the firewall, floor panels, cabin and wheel-arch liners, and sound-deadening foam in some areas post-shell construction to help suppress noise further. To complement the quiet cabin, CT 200h's efficient exterior design minimises air disturbances over the body and therefore unwelcome wind noise. The new Lexus CT 200h has a highly rigid yet light body for a combination of high-level safety, responsive handling, low NVH and optimum durability. Weight-saving features include the Lexus-first feature of an aluminium rear door, as well as an aluminium bonnet and aluminium bumper reinforcements. CT 200h's body boosts handling by providing a stable platform for the suspension, which Lexus achieves through a combination of design, materials and manufacturing techniques. Key features of the CT 200h body design include optimisation of the body rigidity around the suspension and steering mounts. Lexus has maximised under-body rigidity by fitting front and rear suspension-member braces, as well as a high-rigidity front-floor brace, HV battery carrier and rigid lower-rear supports. The HV battery carrier's strength adds to body rigidity around the rear-suspension mounts. Lexus has optimised the rigidity of the front-cowl area by connecting the front suspension towers to each other by a straight front-cowl reinforcement. A network of six braces links the front suspension towers, front cowl and front pillars - to ensure longitudinal and lateral rigidity. The front engine mounts have unique lateral stabilisers. Lexus has also boosted handling stability by adding rigidity at the rear of the vehicle. It has enhanced the torsional rigidity of the upper body by adopting a fully enclosed cross-section for the entire circumference of the rear-door aperture. There is a reinforcement on the back side of the rear body member, while the rear-wheel housing has an inner gusset and outer reinforcement. Lexus made extensive use of high-tensile strength steel, with two grades used for key under-body components and four grades in the various upper-body panels. Lexus has also maximised under-body rigidity through careful attention to manufacturing methods. It has increased the density of spot welds connecting the rear-floor cross-members to the wheel housing and minimised the spot-weld pitch at the base of the pillars. Lexus designed the new CT 200h with the focus on agility and crisp, responsive handling. CT 200h's front suspension is a bespoke MacPherson-strut system with wide-based lower arms to maximise suspension rigidity and steering response. A large-diameter (24.2 mm) stabiliser bar connects directly to the strut body, to reduce uncontrolled body roll. In an industry-first design feature, the stabiliser bar is partially integrated with the suspension member, to optimise roll rigidity, control, braking stability and manoeuvrability. Special features of the front suspension also include positioning the front stabiliser bar to ensure high roll rigidity. The steering box has rigid mounts that connect directly to the front suspension member, to provide a linear steering feel. CT 200h's bespoke rear suspension has trailing-arm double-wishbone suspension, to optimise handling stability, roll rigidity and ride comfort. The rear shocks are separate from the coil springs, to increase cabin and luggage space. Lexus has designed the rear geometry's camber angle, toe angle and arm layout to optimise handling stability and ride comfort. It has optimised roll rigidity to ensure a stable posture when cornering. The design includes the industry-first of an integrated stabiliser-bar bracket for the 23 mm-diameter stabiliser bar. Lexus has devoted great effort to minimising unsprung weight, and hence improving suspension performance and ride quality. The front suspension has aluminium steering knuckles and stabiliser-bar links as well as lightweight hub bearings and shocks. The front and rear shock valves, oil and seals have been tuned to reduce friction, while rebound springs in the dampers minimise body roll during cornering. Lexus developed CT 200h's steering with the over-arching goal of enhancing driver enjoyment. Electric power-assistance saves power and also means CT 200h can change its steering assistance according to the car's 'mood'. In SPORT driving mode, the level of assistance is reduced, to provide a more direct steering feel. F Sport also has a unique chassis calibration and wheel-alignment settings, for more sporty dynamics - and the added dynamic feature of performance dampers. The F Sport calibration includes revised spring rates front and rear. Lexus has also specially tuned F Sport's front and rear shock rates. Lexus CT 200h F Sport and Sports Luxury have the breakthrough additional dynamic feature of Lexus-first performance dampers front and rear. Lexus technical partner Yamaha invented the performance damper. It is designed to increase agility, stability and ride comfort, as well as driving quality while reducing NVH. The performance damper breaks away from convention by including a precisely machined shock absorber unit in place of the traditional reinforcing strut brace. The gas-pressurised damper is machined with a high degree of accuracy to dampen miniscule - in fact micron-sized - vibrations in the body. Such vibrations would otherwise cause flex in the body. Adding the performance dampers absorbs vibration and increases vehicle stability. The performance dampers in CT 200h F Sport and Sports Luxury are positioned to function as front and rear strut braces, and hence increase both body rigidity and handling - by reducing body flex. The effect of the performance dampers depends on the positioning, installation method and rigidity of the installation position. The dampers are then tuned to achieve the dynamic feeling CT 200h requires. For example, they can eliminate the slight discomfort felt when turning the steering wheel, as well as the minute deviations in vehicle behaviour during straight-line acceleration - thereby increasing both agility and ride comfort. Performance dampers can also contribute to improved audio performance, providing a similar effect to traditional sound-deadening materials. This results in clearer sound, improved bass performance and reduced panel vibration. Lexus' all-new CT 200h hints at the future design direction for Lexus vehicles under the marque's L finesse design language. In profile the production vehicle holds true to the original concept vehicle design. With a distinct new frontal design, wide stance and sweeping lines which mimic the natural flow of wind over and around the bodywork, the CT 200h introduces a more resolute and aggressive look to Lexus' L finesse design language. A refreshed 'spindle' design that combines both upper and lower grilles provides hints of the new corporate face of future Lexus vehicles. The new frontal treatment brings the grille forward of the headlamps for greater visual integration with the bumper mid-section. It incorporates a deeper, more sculpted interpretation of the L finesse signature arrowhead motif. The grille is flanked by headlamp clusters clearly positioned on a higher plane than the grille itself - drawing the eye to the top of the vehicle. Arrowhead-shaped daytime running lights will progressively become a feature of the Lexus range. New, LFA-inspired compact and aerodynamic door mirrors with an integrated LED turning-signal lamp feature a two-tone finish for a slimmer appearance. Sweeping tail lamps incorporate a Lexus-unique L-shaped motif first introduced in the LS. This combines with a broad rear bumper design to reinforce the new hybrid's wide, firmly planted stance. The flow of air away from the rear of the CT 200h is carefully controlled through the finely honed trailing edge of the deep roof spoiler, aerodynamic fins at the corners of the rear windows and the sharp, near-vertical junction of rear guard and bumper. Complementing the overall exterior are three wheel options: 10-spoke 16-inch alloy, and a unique 10-spoke turbine-style alloy finished in alloy or in shadow chrome in the case of F Sport models. The Lexus CT 200h Sports Luxury model will feature the most LED lamps on any Lexus to date - with no less than 89 LEDs fitted to its exterior. The Lexus CT 200h follows in the footsteps of its larger siblings by adopting LED (light emitting diode) lamp technology to save on power. The powerful LED headlamps on the Sports Luxury model reduce power consumption by up to 45 per cent when compared to traditional halogen units, significantly reducing engine loadings and improving vehicle economy. Of the 89 LEDs, 46 are used at the front of the vehicle, eight in the mirror-mounted turn signals and 35 in the rear combination lamp. Lexus was the first automotive manufacturer to introduce LED headlamps on its flagship LS 600hL in 2007. CT 200h will leverage Lexus' recently introduced F Sport brand by offering a unique exterior package to match its specialised suspension tune. F Sport's exterior package includes an aggressive spoiler package featuring front and rear bumpers, side skirts and larger high-mount spoiler. The front spoiler features a larger lower air intake, with two-step lower sill, deeper fog lamps, a unique mesh "IS F-style" upper grille and squarer edges. Larger side skirts and unique 10-spoke dark alloy wheels with IS F-style black centre caps complement the front bumper. From the rear, bumpers feature a two-tone design with an "F1" - inspired rear diffuser instead of twin openings on standard models. A larger roof spoiler that adds 30 mm of length and 10 mm of width strikingly enhances the overall stance of the vehicle. All F Sport models include F Sport badging and privacy glass at the rear. A Sports Enhancement Pack offering the F Sport front and rear bumper (excluding the mesh upper grille), side skirts and larger rear spoiler is available on the Sports Luxury model. The CT 200h is the second Lexus Australia vehicle line to feature Daytime Running Lamps. All CT 200h models will feature the safety device as standard and will be teamed with low-beam lamp technology - either halogen for Prestige, Luxury and F Sport models, or LED for Sports Luxury model. According to the Australasian College of Road Safety**, Daytime Running Lamp (DRL) technology can reduce the possibility of multi-vehicle severe collisions by up to 11 per cent. 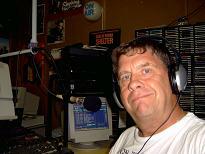 As of 2011 the technology is compulsory equipment on any vehicle sold in Europe. CT 200h's DRLs consist of nine high-intensity Light Emitting Diodes (LEDs) behind a clear diffuser. The Lexus system delivers a clean uniform look that complements the new frontal design. DRLs that feature LEDs have the added benefit of drawing less electrical power and being less susceptible to damage via vibrations or hard knocks compared to other car lamps. Daytime Running Lamps also feature on selected IS 250, IS 350, IS 250C and IS F models. ** Paine M (2003), A review of daytime running lights, report by Vehicle Design & Research Pty Ltd to NRMA and RACV, Sydney, July 2003. The Lexus CT 200h features class-leading aerodynamics that achieve a coefficient of drag of just 0.29. CT 200h's efficient aerodynamics were the fruit of extensive Computer Aided Design and wind tunnel testing which significantly enhanced high-speed stability, handling and ride comfort. Lexus painstakingly detailed every aspect of the CT 200h's upper bodywork to boost aerodynamic performance. The deep front bumper, sharply sculpted front air dam, sculpted bumper corner angles and LFA-style door mirrors have been designed to smooth airflow over the front and down the sides of the vehicle, minimising wheel-arch turbulence. The flow of air away from the rear of the CT 200h is carefully controlled through tapered cabin sides, a deep roof spoiler, aerodynamic fins at the corners of the rear windows and the sharp, near-vertical junction of rear guard, tailgate and bumper - mirroring the airflow of the LFA supercar. The numerous aerodynamic under-body elements include a front lower absorber, engine under-cover and wheel-arch spats, a rear engine under-cover, centre floor under-covers (with aero fins), rocker mouldings, tank side and rear floor under-covers and rear-wheel arch spats. In addition, Lexus has added diffuser fins on the front under-cover. Even the installation of the main exhaust muffler and the shape of the rear bumper cover have been optimised to create the smoothest possible under-body airflow. The CT 200h will feature three wheel and tyre packages. Prestige models will feature a stylish 16-inch, 10-spoke alloy wheel, with each spoke featuring a slight twist. Luxury and Sports Luxury models will feature a unique 10-spoke, 17-inch alloy wheel in which every second spoke has a swept outer design. The 10 spokes converge at the centre in a three-dimensional, double-star pattern with a raised centre cap. F Sport models receive a unique dark alloy version of the 17-inch Luxury and Sports Luxury alloy, featuring a black, IS F-style centre cap. All models wear Yokohama dB tyres and feature a temporary spare tyre. Prestige vehicles can also be specified with 17-inch alloys as part of either Enhancement Pack. Lexus CT 200h is the first vehicle in its segment to offer the Pre-Collision safety System (PCS). Lexus CT 200h has segment-leading active safety on the Sports Luxury model, with a package of electronic active safety systems headlined by Active Cruise Control and the PCS. Active Cruise Control and PCS are standard equipment on CT 200h Sports Luxury. They share a millimetre wave-length radar sensor, fitted behind the Lexus badge in the radiator grille. All Lexus CT 200h models have an electronically controlled brake system with ABS, electronic brake force distribution and Brake Assist. CT 200h also has Vehicle Stability Control (VSC), Traction Control (TRC) and Hill-start Assist Control, which operates in forward and reverse. In SPORT driving mode, the VSC and TRC algorithms are modified, to allow the driver to fully exploit the vehicle's extended dynamic abilities. Lexus CT 200h also has emergency brake lights. The LED brake lights flash when the driver initiates emergency or sudden braking at speeds above 55 km/h. LED brake lamps illuminate more quickly than conventional bulb-type brake lamps. The CT 200h has a rear-view camera on Luxury, F Sport and Sports Luxury, and on Prestige Enhancement Packs. There are two types of rear-view camera screen. Prestige Enhancement Packs have a screen in the rear-view mirror, while Luxury, F Sport and Sports Luxury have the screen in the navi screen. CT 200h's active safety equipment also includes daytime running lamps. An electrochromatic (self-dimming) interior rear-view mirror is standard equipment on Prestige Enhancement Packs, Luxury, F Sport and Sports Luxury. Electrochromatic external mirrors are standard on F Sport and Sports Luxury. F Sport and Sports Luxury grades have front fog lamps, and Sports Luxury has LED projector-type low-beam headlamps. The Lexus CT 200h is the first Lexus with a rear seatbelt monitor system, featured on all models. The monitor system displays rear seatbelt status in the Multi-Information Display. It is an important safety aid, especially for parents with young children. All CT 200hs' have eight SRS airbags, including driver and front-passenger knee airbags. Whiplash-injury lessening (WIL) front seats are standard equipment. The WIL seats in CT 200h are the latest-generation Lexus-design seat frame, which allows the occupant's body to sink into the seatback, while the forward placement of the head restraint supports the head sooner. Lexus designed these seats to achieve the same function as the active head restraint system, with less weight and complexity. Features to assist pedestrian safety include attention to the windscreen wipers, as well as design features to offer better pedestrian leg and head protection. Lexus CT 200h has the passive-safety foundation of high-strength body with collision impact-absorbing structures. The body makes extensive use of high-tensile strength steel sheet. Lexus designed the body with multiple energy-absorbing paths, to limit cabin deformation in the event of an accident. The frontal collision structure includes: high-tensile steel front side members; an under-member to distribute impact forces from the radiator support; a reinforced belt line to help distribute collision forces over the front pillars, door belt line reinforcements and rockers; a dash-panel cross-member to distribute impact load from the front side-member to the floor member and upper body; and a floor-tunnel side member to ensure floor tunnel strength and distribute impact forces from the front side member. The CT 200h body's side-impact collision protection measures include: bulkheads at the end of the various floor cross-members to create a structure that transmits side-impact forces to the cross-members; side-impact beams in the doors and a side-impact box in the floor tunnel, between the front seats. High-tensile strength steel sheet is used to strengthen the centre-pillar outer reinforcement, centre-pillar hinge reinforcement, rocker outer reinforcement, rocker inner, front-door belt line reinforcement and roof-centre reinforcement. CT 200h's rear-collision performance has been designed to comply with the US FMVSS301/305 regulation on 50 mph high-speed rear collisions. The body design includes a high-strength rear floor member to help suppress body deformation in a collision. Lexus CT 200h has a state-of-the-art braking system, combining brake-by-wire technology and regenerative braking. CT 200h's Electronically Controlled Brake system (ECB) was designed to minimise weight and package efficiency, while optimising fuel economy. Electronic control allows a reduction in brake system weight, while providing more precise brake-force distribution and closer cooperation with other related systems, which is beneficial to Vehicle Stability Control operation. Lexus CT 200h's friction brake package consists of 255 mm by 25 mm ventilated front discs and 279 mm by 10 mm solid rear discs. The brake callipers have aluminium callipers and resin pistons to save weight. CT 200h's regenerative braking system uses the electric drive motor as a generator, to convert kinetic energy to electrical energy. The ECB actuator on CT 200h Sports Luxury has the additional feature of Pre-Crash Brake - where it can automatically apply the brakes in an emergency situation and is also primed to apply maximum braking force at a slight touch of the pedal. The Lexus CT 200h features eight SRS airbags as standard equipment. 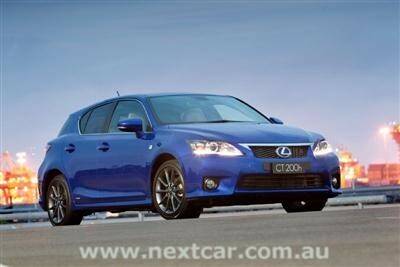 CT 200h has a dual chamber passenger side airbag - pioneered by Lexus in the 2005 IS 250. It is designed to lessen the impact of airbag deployment on the front-seat passenger. The twin-chamber airbag features an advanced V shape, to create a depression in the centre of the airbag upon deployment and hence better distribute physical impact to the shoulders and upper torso. The driver and front passenger airbags are complemented by driver and front-passenger knee airbags, front-seat side airbags and full-length side curtain-shield airbags. CT 200h has SRS airbag system sensors in the front of the vehicle, the centre pillars and the rear pillars. Lexus was the first-in-category to offer Australians reverse camera technology with its RX SUV. Lexus' all-new CT 200h continues this tradition, becoming the first vehicle in its class to offer reversing camera technology. 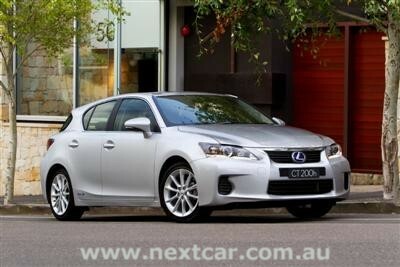 All Lexus CT 200h Luxury, F Sport and Sports Luxury models feature reversing camera as standard equipment. Prestige models can be specified with reverse camera technology as part of an Enhancement Pack*^. Luxury, F Sport and Sports Luxury models feature reverse camera display as part of the seven-inch in-dash navigation screen, offering reverse guide assist and vision when reverse is selected. To avoid any possible incident, the reverse screen will open to display rearward images even if the screen is set to the closed position. The reverse camera^ also allows the driver to see the rear bumper and offers a guidance system that outlines the projected line of travel according to steering inputs. The rear guidance system can also be specified to distinguish between reverse and parallel parking. Prestige models specified with optional reverse camera will display reverse images via a 3.3-inch full colour screen mounted in the rear-view mirror. *^ Prestige models can be specified with one of two Enhancement Packs, both including mirror-mounted reverse camera. ^ Reversing cameras are designed as a driver-assistance device only and should not be used as a substitute for skilled driving and safe parking practices. The area into which the vehicle is to be reversed must be visually monitored by the driver while parking.